Spring birthday parties and baby showers are the perfect excuse for crafting fun gifts for the little guys! 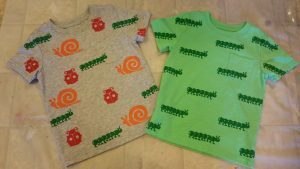 Today’s project focuses on one of our favorite techniques- fabric stamping! Lindee and I love this kind of project because it’s so customizable! We love stamping dish towels (see that tutorial here) as well as accessories (check out my Funny Bunny scarf)! T-shirts maybe my favorite things to stamp, though, because you can create looks you can’t find in stores! I think the little guys will love some personalized duds, so let’s get started! Before any painting could happen, I washed, dried, and sometimes ironed the clothes. (You don’t want the fabric shrinking under your beautiful, non-shrinking paint job!) You also don’t want paint to bleed from the front of the shirt onto the back. One way to prevent that is by inserting a liner of paper or other flat material inside the shirt. I have used big cut-outs from paper bags for large shirts. I have also used sheets of wax paper when I anticipated using a lot of wet paint. For my project today, I used pieces of scratch paper cut to fit into the body and sleeves of the shirts. That done, I got out my fabric paint, paint brushes, paper plate palette, and collection of foam stamps. 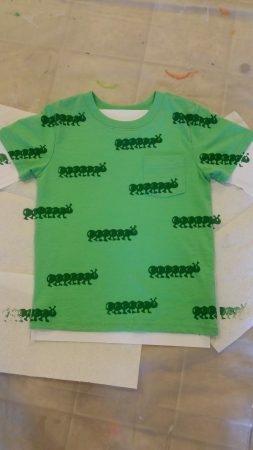 I’m going with a bug theme this time! You can find a cute set of similar stamps from Amazon (here)! I bought the stamps for this project, but you can check out my Funny Bunny scarf tutorial (here) to see instructions for making your own stamp! 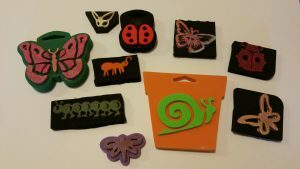 I started by doing a test run with the caterpillar stamp. On my palette, I mixed paint colors until I got the yellowish-green color I wanted. Next, I painted the stamp with paint. I practiced stamping several times onto scratch paper. I prepped my work surface (in this case, my kitchen floor!) with a drop cloth made from a plastic shower curtain. I had already lined the baby onesie with paper, and I now placed it on several pieces of paper towel. Using the same method I had used on the scratch paper, I began stamping the onesie. I tried to space the caterpillars evenly but also somewhat randomly. The paper towels caught extra paint from caterpillars that were “crawling” on and off the sides of the onesie! 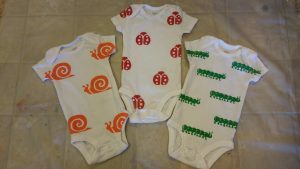 I used this method with other stamps and paint colors to embellish more onesies! So cute! 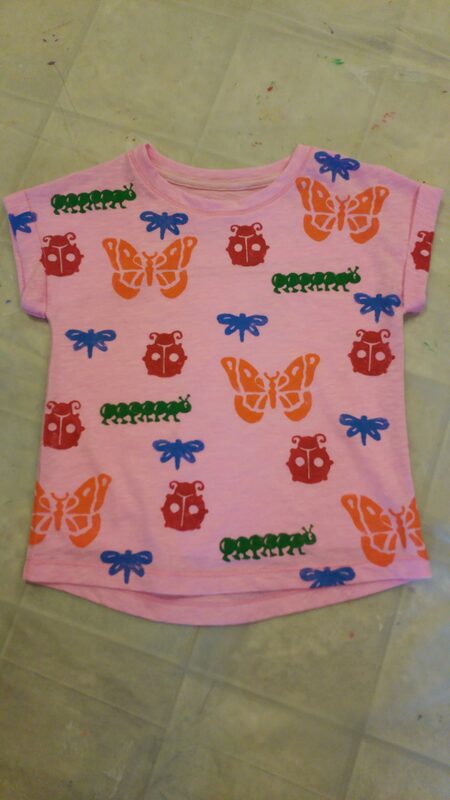 For the big kids, I stamped some shirts with only one kind of bug and stamped others with a mix of bugs and colors!